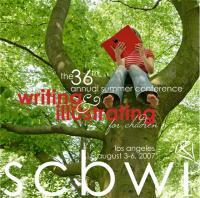 I spent yesterday with thousands of other children’s book writers at SCBWI’s summer conference in Los Angeles. And I came away with the renewed conviction that, if you are writing for children and don’t already belong to SCBWI, you must join. Now. The summer conference of the Society of Children’s Book Writers and Illustrators goes on for another couple of days, if you’re in the L.A. area and want to check it out. You can register on the spot. Their schedule for the weekend is on their website. The vibe there is so pro-writer and personable, it invigorates you about the field you’ve chosen. And let’s face it, the field of children’s books can be competitive and daunting, especially when you’re on the outside with your face pressed against the window, drooling. Where do you start to even look for the door? And when you find it, how the heck do you unlock it? SCBWI gives you tips for both of those, and for many more things, like how to make your writing great so that you can have success once you get through that door. I love ’em! If you haven’t found your people already, take a look at SCBWI. I swear, I’m not getting any kick-backs. And while I could be slightly giddy from arriving home from L.A. at 1 a.m. then getting up at the usual 4:45, I’ve had this impression about the annual conference for years now, so I know it’s not just sleep-deprivation talking here. And it’s not the added thrill of having a star sighting at the L.A. hotel. While I enjoy Steven Baldwin’s movies, I wouldn’t say sighting him was reason enough to rush to the conference. Go to learn and to be in a supported environment; get far away from your isolated computer, just for a day. You just might find your people.